Nicklas Lidstrom did two things on Sunday that he's never done before: Attend an auto race of any kind and push a car's speedometer past triple digits. The Red Wings captain was invited to be the honorary pace car driver for the NASCAR Sprint Cup race at Michigan International Speedway in Brooklyn, Mich.
"I watch it on TV, but I've never been to a race before," Lidstrom told the Wings' website. Seated behind the steering wheel of a Ford Mustang GT on an overcast Sunday morning, Lidstrom took a few laps around the two-mile oval in the Irish Hills, located in south- central Michigan. "The first few laps I was just keeping it at 55 (mph), but then the last lap I had the chance to step on it a little bit," he told the Wings' site. "It had some power to it. When you come out of the turn you want to step on it and start picking it up. But it was fun, especially on that oval with its 18-degree angle on it. It's a different feeling when you haven't been on something like that before." 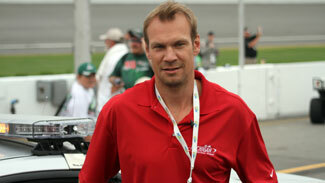 Lidstrom was among several celebrities taking part of pre-race activities Sunday. Joining the Wings' captain were Ndamukong Suh, the Detroit Lions' first-round draft pick in 2010, who served as an honorary official for the race; and Hollywood actors Adam Sandler and Kevin James, who were grand marshals. NASCAR driver Brad Keselowski, who grew-up a fan of the Red Wings in suburban Detroit, invited Lidstrom. "I met Brad a few weeks ago at a Tigers' game, and that how it all started," Lidstrom said. Keselowski and his No. 12 Penske Dodge started 10th in the 43-car Sprint Cup Series field, which was won by Denny Hamlin. Keselowski, who finished 27th, gave Lidstrom a special tour of his car on pit row moments before the start of the race. Asked if he thought that race car drivers are in the same athletic category as other athletes, Lidstrom said, "Having the chance to ride earlier, I think they're very much athletes; what they have to endure for two hours, whether it's the heat or staying focused and keeping their concentration. "I was going about 115-120 miles-per-hour, and that was very fast. So to go through what they're going through for a couple of hours – and they have to be in shape, too – I'm very impressed with what they're doing."